Imagine a large, strong, white cardboard box full of fresh croissants and different jams, pastries, porridge and napkins, tied with a beautiful blue satin ribbon arriving on your doorstep on a SAD autumn morning; but this one is carried by a cheerful young lady with a lovely smile so there is no bending down to pick up the box. It is carefully placed in your eager hands and, in addition, there is a little carry sack with 2 bottles of fresh fruit juice and a newspaper. This is Bonjour Breakfast, a delicious and innovative delivery service which will cheer you and your guests with an instant, ready-to-put-on-the-table meal on a day of your choice. 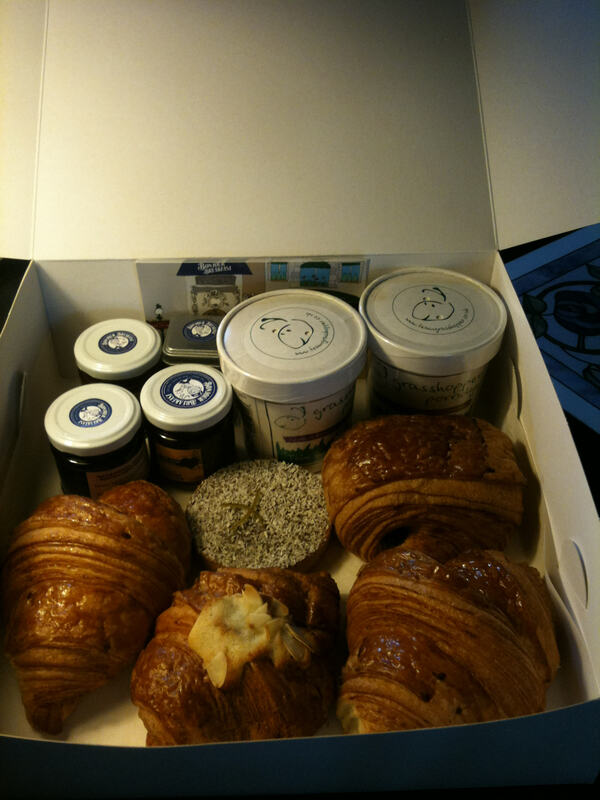 The box contents may be of your choice too, from champagne to flowers to any fresh pastries and coffee or tea. The pastries were fresh, the jam tasty, the juices thirst-quenchingly cool and the idea unique. Delivery is free on orders over £10. We thought it a great idea for a Happy Birthday gift, but it is an even better idea as a Happy Me Day present, to be taken regularly rather than just once a year. Bonjour Breakfast is the brainchild of the delectable and enterprising Rachel Lampen. Phone 0844 3358445 or go to www.bonjourbreakfast.com to experience the delight we had on our box’s arrival.